Age 35.6 ICR IOWA median age of 35.6 years is younger than the National average at 37.2. Employment Growth Rate 6.34% ICR IOWA had Total Employment of 200,893 and was represented by growth of 6.34% between 2006 and 2015. Comparatively, the National growth rate was 5.26%. Mean Commute Time (minutes) 19.6 Compared to 18.9 minutes for Iowa, and 25.9 for the national average, Cedar Rapids has a mean commute time of 19.6 minutes. Median Household Income Growth Rate 12.27% ICR IOWA median household income is $57,928.57, compared to the National rate of $53,889.00. Between 2009 and 2016, ICR Iowa had a 12.27% growth rate compared to the National rate of 4.79%. Per Capita Personal Income $47,332.14 In 2015, ICR IOWA Per Capita Personal Income was $47,332.14 and experienced a 40.95% growth rate between 2006 and 2015. Per Capita Gross Domestic Product $56,305.50 In 2015, ICR IOWA Per Capita GDP continued to shine outpacing the National average, $56,305.50 to $50,054.00. Additionally, when comparing the growth from 2006 and 2015, ICR Iowa Per Capita GDP had a growth rate of 13.34% versus the National Average of 2.40%. Cost of Living Index 96.7 To calculate the cost of living in Cedar Rapids, the Economic Alliance participates in the ACCRA Cost of Living Index report. The Economic Alliance is a member of ACCRA, a non-profit organization and producer of the nationally renowned Cost of Living Index. ACCRA produces the Cost of Living Index to provide a useful and reasonably accurate measure of living cost differences among urban areas. In 2015, ICR IOWA of Living Index was 96.7. See how Iowa compares to other states with the IEDA 50 States Comparison tool. Iowa Wage Report data is developed using data from the OES employment and wages program. Wage estimates are updated annually using the Employment Cost Index. Wage and employment data are available for the State, four Balance of the State areas, fifteen IWD regions and nine Metropolitan Statistical Areas. The Economic Alliance maintains and updates demographic, economic and spatial information for the Cedar Rapids Metropolitan Statistical Area which includes Benton, Linn and Jones County. Review all demographic and economic data for our area in the annual Demographics and Economic Report. Workforce attraction and retention are essential to the success of the ICR IOWA region. 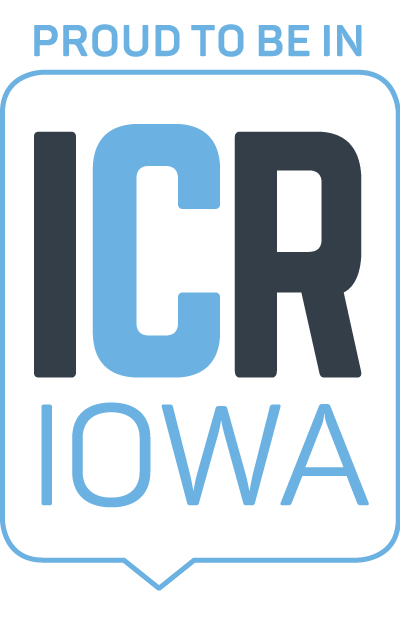 In 2016, the Economic Alliance launched ICR IOWA, a joint venture with the Iowa City Area Development Group to drive collaboration on regional workforce efforts. Get workforce data, tools, internship information, new jobs training information and more at www.icriowa.org. Insights from business leaders drive priorities and initiatives the Cedar Rapids Metro Economic Alliance chooses to undertake related to business recruitment and retention, workforce development community development, business support, public policy, quality of life and other issues. Find a list of Major Employers here. We get input in a variety of ways, but one of the most comprehensive tools we use is called a Synchronist Survey, which provides in-depth analytics we can also compare to similar data on a state and national basis. Each year the Economic Alliance conducts in-person interviews with interstate commerce companies to generate annual existing industry data. In 2018, we met with 104 C-level executives, plant managers, and site leaders and are pleased to provide and highlight a few of the major outcomes from this research. Review the full 2018 Existing Industry Report below. Regional economic indicators including population and wages, quality of place and economic development necessary data for strategic opportunity can be found here. As we continue to work toward our common goal of improving the competitive landscape of our interstate commerce companies, the Economic Alliance uses this data for workforce strategies, developing economic development marketing opportunities and determining industry sector-specific needs. The Existing Industry Report includes Regional Economic Indicator data, which was sourced by: Cost of Living Index by ACCRA, www.trade.gov, Bureau of Labor Statistics, U.S. Census and Bureau of Economic Analysis. Beyond the list of advantages the state's business climate provides, Iowa offers an assortment of financial assistance programs to support companies in an expansion or relocation mode. The Cedar Rapids Metro Economic Alliance will work with you and evaluate programs available to your company at both local and state levels to determine the best possible package for your project. Provides direct financial assistance and tax credits to qualifying businesses to offset the costs incurred to locate, expand and/or modernize. The direct financial assistance typically is in the form of a forgivable loan and a zero or low interest loan. The tax credits include an Investment tax credit against your Iowa corporate income tax liability; a refund on construction-related sales tax; and an increase in the Iowa statutory research activities tax credit, which is refundable if you don’t have an Iowa corporate income tax liability. The wage threshold for this program has recently increased. Read full details on the Iowa Economic Development Authority's website. Provides little to no cost job training services to current employees of eligible businesses by helping companies train current employees with new skills, and working with local community colleges which assess training needs, determine funds available and provide training. Provides businesses expanding their work force with new employee training. The program made available through Iowa’s community colleges is administered locally by Kirkwood Community College. The program is funded through the new employees’ withholding taxes at no cost to the employee or the company. For more information, visit www.kirkwood.edu/260e. Provides tax credits to projects for redeveloping brownfield or grayfield sites in Iowa. The tax credits are based upon a percentage of the qualifying expenditures made to redevelop a qualifying site. You may use the tax credits to offset Iowa corporate income tax liability or you may be sell the credits to entities that can use them. Allocations of tax credits are typically made annually in August or September. If you're interested in applying for this program, the online application for fiscal year 2019 opens July 1. Economic Alliance members can utilize our expertise is the application process and can reach out to Jamie Toledo for more information. Provides funding for public roadway improvements that directly support expanding businesses. Cedar Rapids Metro Statistical Area and ICR Iowa are home to industry leaders in Electronic Equipment & Design, Insurance & Financial, Healthcare, Logistics & Distribution and many more innovative industries. The following is a selection of the largest employers, public sector and private sector, in ICR Iowa. For a complete list, contact us at 319/398.5317. The 2016 Laborshed Analysis shows the distribution of the workers irrespective of natural or political boundaries, as well as provides community economic developers and existing or prospective employers a flexible tool to understand the local labor market, employment center and make informed expansion and site selection decisions. Our central location allows companies to enjoy many low-cost transportation options whether it is interstate highway, rail or air. 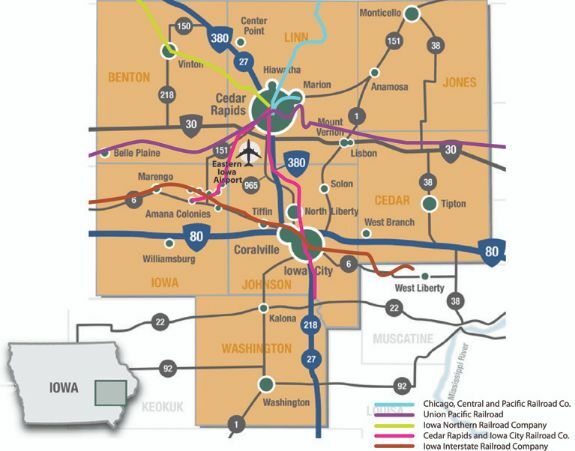 Interstate 380 runs north and south through downtown Cedar Rapids, and has easy, close connections to Interstate 80 and only two hours from Interstate 35 – two of the nation’s most prominent interstate highways – and allowing access to all four domestic borders. The Cedar Rapids area is the only area that can serve Minneapolis, MN; Milwaukee, WI; Chicago, IL; St. Louis, MO; and Omaha, NE by freight carrier in a one-day round-trip as permitted by federal regulation. See the map at iowadot.gov. The Cedar Rapids region is well-known for being a rail-hub and providing reliable, easy access to the principal rail lines throughout North America. The Union Pacific, Canadian National Railroad, Iowa Interstate, Iowa Northern, and Cedar Rapids and Iowa City Railway Co. (CRANDIC) companies all offer access in Cedar Rapids, and provide connections to the BNSF Railway, CSX Transportation, Norfolk Southern, Canadian Pacific, Kansas City Southern Lines, Iowa, Chicago & Eastern Railroad, and Chicago Central. See the Iowa Rail Map. ICR IOWA has multiple domestic and international connections through direct flights available at The Eastern Iowa Airport (CID). Nearly one-third of the country’s population is within an hour flight of our area. The Eastern Iowa Airport has nonstop commercial service to 13 destinations including: Atlanta, Charlotte, Chicago, Dallas/Fort Worth, Denver, Detroit, Las Vegas, Los Angeles (seasonal), Minneapolis, Orlando-Sanford, Phoenix-Mesa, Punta Gorda/Ft. Meyers and St. Petersburg/Clearwater, and is ranked in the Top 10 of airports in the seven-state Midwestern region, based on number of non-stop destinations and number of daily flights. This ranking includes airports in major metropolitan areas including Chicago, Minneapolis/St. Paul and St. Louis. The airport is also served by air cargo carriers FedEx, UPS and DHL shipping approximately 20,000 tons of cargo annually. The Eastern Iowa Airport is an asset and benefit to our business community, see how in this short video. Learn more about CID's air service formula for attracting and retaining air service in the area here. The Economic Alliance offers an integrated, innovative, “one-stop shop” for site selection consultants or companies researching expansion or relocation options. As available sites and buildings change constantly, the Economic Alliance utilizes Location One Information System (LOIS), an online data database of listings for available commercial and industrial properties, to help you determine the best option for success. If you are a realtor or property owner that wants to add a listing within the Cedar Rapids MSA to LOIS, click either the building form or site/land form. Search a listing on LOIS. Iowa's first certified Super Park and Mega Park were announced in 2016. 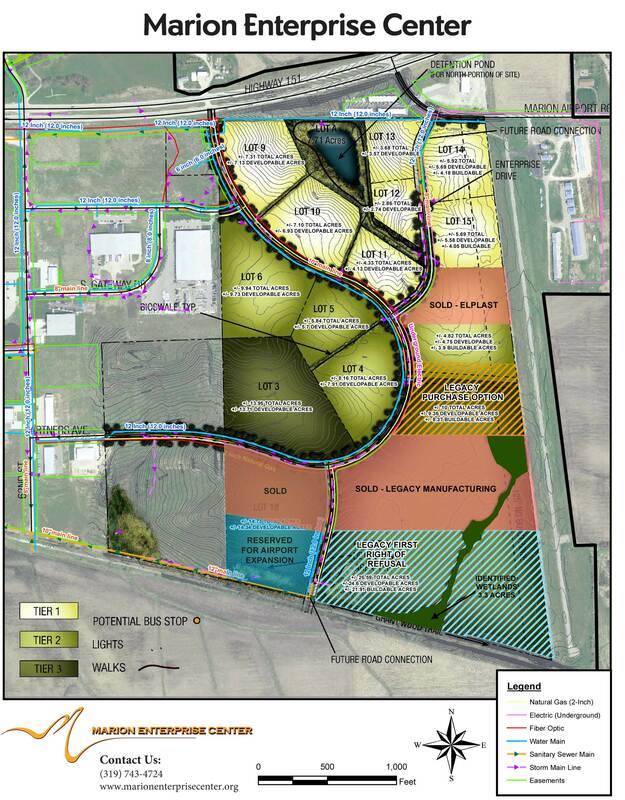 Alliant Energy also announced plans for Big Cedar Industrial Center, a 1,300-acre Mega commercialand industrial park on the southwest edge of Cedar Rapids. The Mega site is located adjacent to the proposed intermodal facility which was also announced and awarded federal funds in 2016. Additionally, the Marion Enterprise Center (MEC) is a 184 acre business park located on the east side of the city of Marion, Iowa, near north-south state highway 13 and along east-west highway 151. MEC is jointly developed by the Marion Economic Development Corporation and the City of Marion. The building sites that are available can be flexibly split and/or combined to meet the specific requirements of a project. The Cedar Rapids area and Economic Alliance have a strong record of supporting international trade, a key component of the region's healthy economic climate. The Eastern Iowa Airport has been designated one of a limited number of Foreign Trade Zones in the Midwest. With the FTZ No. 175 status, Cedar Rapids is rapidly becoming an important hub for international trade, and is the United States' largest national exporter on a per capita basis. A Foreign-Trade Zone (FTZ) is a site within the United States where foreign and domestic merchandise is considered to be in the stream of international commerce. Foreign and domestic merchandise may enter this zone without a formal customs entry, the payment of customs duties, or federal and state use/excise taxes and personal property taxes. Firms may also perform manufacturing or processing operations, packing or inspection checks and a variety of other tasks using imported goods before duties are paid. Scrap or rejected goods not entering the commerce of the United States are never taxed. By using a number of cost saving strategies, firms may use Foreign-Trade Zones to decrease operational costs associated with customs duties. Targeted research and data requests are a benefit included in EXECUTIVE and above membership levels at the Economic Alliance. For more information, please contact us at economicalliance@cedarrapids.org at 319/398.5317.